Community radio as the name suggests, resonates the feeling of oneness, of coming together to help build a community that we wish for. Jamia Millia Islamia is one of the pioneer institutions in North India to receive a license from the Ministory of Information and Broadcasting to run a Campus Community Radio.Radio Jamia 90.4 FM began its first trial live transmission for 60 minutes on 15th March 2005. The regular transmission commenced from 26th May 2005 for sixty minutes each weekday. Radio Jamia 90.4 FM formally inaugurated on 6th March 2006, by then Vice-Chancellor Prof. Mushirul Hasan has been a proponent of shared values and preservation of local cultures. Today, it is the pulse of the community and serves to create an informed, educated and a confident community. The members of the community, who frequently take part in the production of shows, fulfill the objective of improving lives and thoughts of target audience and cater to their specific interests and demands. It offers a myriad range of show formats, to suit diverse tastes of the target audience. Be it interviews, discussion, Vox-Pop (Voice of the People), it strives for innovative and effective ways to work in tandem with the community. The punch line ‘Aap Ki Awaaz’ only goes further to reiterate the importance of participation from community members. Jamia Millia Islamia funded this noble effort for infrastructural development and procurement of technical items. The funding strategy involves charges levied from students of the university. It is a responsible channel and in order to meet the growing demand of our listeners, we have gone online! So no matter wherever you are, you will not miss your favorite shows. This is another glaring step towards our long commitment and dedication for the upliftment of all sections of society. 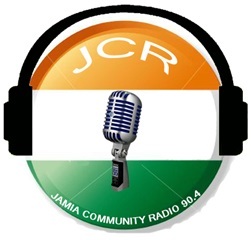 Jamia Community Radio has become the voice of people. It serves as a pertinent platform to discuss, debate, and share views and empower all sections of the community. They can come to our studios, and raise their concerns, dissent and spread love, so that a dialogue transpires within the community. With more and more interactive programs, people are able to give their feedback and it helps complete the communication chain between Jamia Community Radio (JCR) and the audience. The essence of Radio Jamia 90.4 FM is its broad outlook and public service ideology with emphasis on catering to both general and student community of the area. The coming of the channel has helped us to make specified content for our specified target audience helping alleviate specific issues.